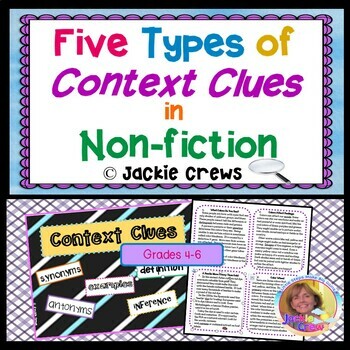 This 25 page product has a variety of ways students can practice identifying and finding context clues in by reading text, practice pages, task cards, and writing. Finding context clues in text is a challenge for many students including my ESL students. 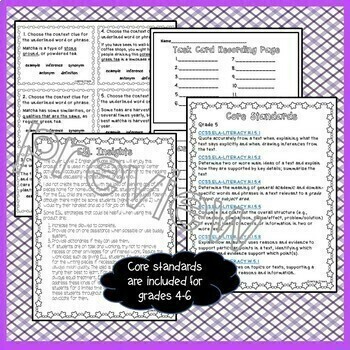 I designed this packet especially for grades 4-5, but it could be used in higher grades so I included standards for grade 6 as well as for grades 4-5. This packet is differentiated so teachers can pick and choose which parts will work the best for their students. I have used it for students who are independent learners in centers, as well as one-on-one tutoring situations so it is adaptable to what you need. Some pages could be adapted for use with other non-fiction selections of your choice with the exception of the tri-fold. The tri-fold was designed just for these particular task cards. 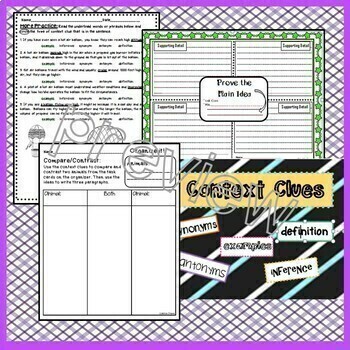 • Trifold organizer for context clue types (The trifold is best used in a guided fashion. Answer keys for the trifolds for each of the task cards was purposely left out so the teachers and students can search for context clues together and discuss their findings).